My Duster was bought March 13, 1970 in Bozeman, Montana from the Rolph and Wood Chrysler/Dodge and Plymouth dealership. The price was $2,426.00. I even remember the salesman’s name, Gene Arpin. It was restored in 2000 to nothing short of perfection!! All of the restoration components were done by firms in Helena, Montana. John Hazen Repairs did the mechanical items. When the mechanics were completed, the car now features a 1968 Cuda 273-V/8 Commando engine, 4 BBL Heads,[9-1 compression ratio], and a 1965 Dodge Dart 904 automatic transmission. Jamies Body Shop did the exterior after obtaining a hood, front bumper, passenger door, and taillights from Syness Auto Wrecking. Mt. Helena Upholstery did the interior and Auto Concepts installed a vinyl top and did the striping. WHY I LOVE IT!! IT WAS MY FIRST BRAND NEW CAR!!! Many trips were made to the Dairy Queen in Bozeman, Mt. for a Dilly Bar! Now, it’s the Dairy Queen in Helena for a hot fudge sundae!! I am a member of Capital Carriages Antique Auto club, Helena, Mt., a chapter of our state club, The Montana Pioneer Antique and Classic Auto Club. If you are interested in joining our club, click the Capital Carriages.org link located on thre right hand column of this site, fill out the application and mail it with a check for the appropriate dues to Jim O’Connor, PMB 2046, One Jackson Creek Road, Montana City, MT. 59634 and Jim will take it from there. If you live elsewhere in the state, click the Montana Pioneer and Antique Auto Club link on this site and it will direct you to the contact person of a chapter near your Montana residence. A link to all major national car clubs is also included on this site if you are thinking about joining a national club. This shot was taken at a car show in Billings, Montana several years ago. I don’t have any statistics to go by, so will just say, this was a great job of restoration. I don’t recall hardly any differences between 1937 and 1938 models. The only difference that really stood out to me was the shape of the headlight shells. The 38’s were not quite as bullet like looking! This pickup is one in a million. It is very restorable if and when the owner ever decides to do it. This is what a nearly fully accessorized 1941 looks like. I always liked full wheel discs rather than the little rim type that are on this car. 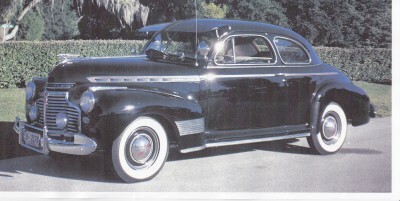 I have fully described in the text of the other black coupe present on this site why I really have always liked 1941 models. I Knew It When It Was New!! Seldom do I see 1937 Pontiacs in my travels, so was very glad to see this one show up at a tour sponsored by the Montana Pioneer and Antique Car Club, Capital Carriages Chapter, in Helena Montana. I had an uncle who sold this model when they were new at the Knox-Davis Pontiac-Cadillac dealership in Enid, Oklahoma, so it brings back very fond memories. Seeing a 1934 Dodge is like seeing a rare bird. I snapped this picture while attending a spring tour sponsored by the Montana Pioneer and Antique Car club held at Choteau, Montana several years ago. Build the car, but paint it black!!! 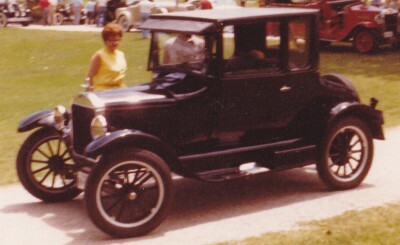 As I understand it that was the deal until the model year 1926 and Henry was forced to change his mind as sales were down 17% from 1925. Hence intorduction of Fawn Gray, Highland Green, and Royal Maroon. Rumors were flying that Ford was about to come out with an entirely new car, so that sure didn’t help sales! People were making more money and were going for more upscale automobiles, so a change was needed badly and that happened with the introduction of the 1928 models. Finding pictures of 1932 Oldsmobiles occurs so infrequently I was delighted to run across this great snap shot. I find that you don’t see them very often is because Oldsmobile total production in 1932 was only 20,144 and in years just before the beginning of the depression in 1929, production figures ran between 60,000 and 100,000, so I’m sure the volume numbers of this car sometimes called the Patrician were very low. It features a 6 cylinder, 74 horsepower engine and certainly resembles it’s 1932 Cadillac counterpart exterior design. Somewhat of a novelty in for the 1933 Chevys was the built in trunk!! Chevy caught on to the fact people were tired of having to load the entire family plus luggage in the interior of their automobile to go on trips. 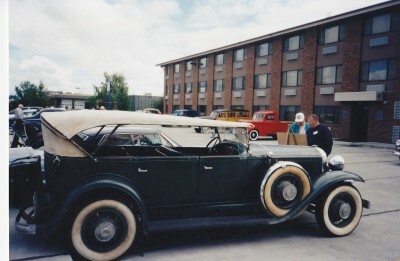 I, with my Mom, Dad and brother personally experienced lack of room when my Dad bought a new 1935 coach with rear mounted spare and no trunk!! 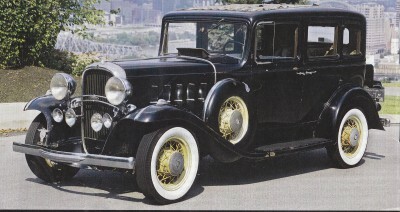 People were slow to catch on to a needed trunk in that in the same Chevy Eagle Series, only 30,657 of the town sedan were produced as opposed to 162,629 coaches in 1933!! What was the public thinking?? World War Two had been over about 13 months when along came the introduction of the 1948 models. People were scrambling to purchase one as cars used during the war were just worn out, gasoline rationing was over and they were ready to roll and that roll continued for the next 10 years. The 1948 models were basically the same as 1942’s as car manufacturers had those designs and with modest refinements could get production going in a hurry! They did that and at the same time were designing the completely new models for 1949!! This model year introduced the deluxe and standard model tudor phaeton. 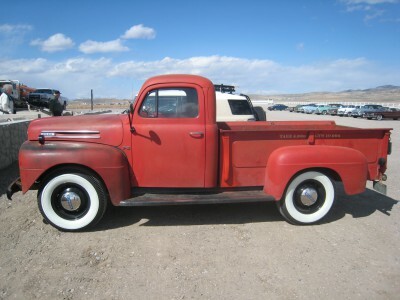 Nice appointments of the deluxe included a leather interior, trunk rack, and left fender mounted spare tire. The base price of the standard was $435.00 and the deluxe $580.00, so considering the fact that the depression was in full swing, it is understandable that the standard sales figure was 11,060 versus only 2,875 for the deluxe. Adds of 1930 included new beauty and that is quite obvious when you look at this beauty! The ’35’s were longer, sleeker and just didn’t look as boxy as their 1933 and 1934 counterparts although the ’33’s nd ’34’s were plenty good looking in their own right! 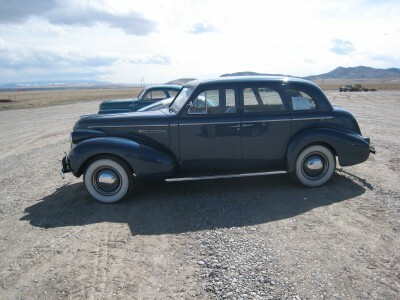 This particular car has been restored to perfection and the owner really enjoys showing it at various car functions. The writer snapped this picture at a Montana Pioneer Antique and Classic car club tour in southwestern Montana which incidentally was one of the best tours my wife and I have ever attended!! That’s right!! 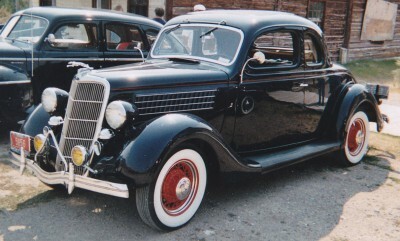 Wire wheels replaced the 1930 model disc wheels and were now standard on 1931 models. Wire wheels were an option on both 1929 and 1930 models and made such a difference in the appearance regardless of the body style. Chevrolet realized this and thus incorporated them with the nice additional touches made to the 31’s,ie, chrome headlight shells, good looking taillights and more attractive body color options. In the writers opinion ’32 models are nicer looking, but the ’31’s run them a very close second!! Owners of a ritzy cabriolet got roll up windows and sturdy A pillars for $190.00 more than the cheapest roadster Ford produced in 1930. Cabs didn’t come near the production numbers of the roadsters which came with or without rumble seats in that only 29,226 cabs were produced as opposed to a total of 122,703 roadsters. LIncoln carrried this basic styling from the 1941 models through the 1948’s. It’s appearance was ellegant in 1941 and has stayed that way even now. 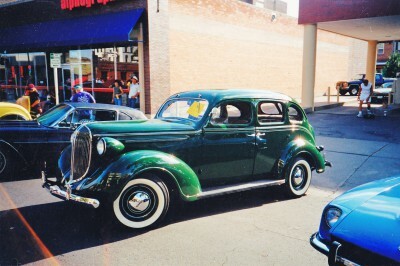 An elderly lady living in my hometown of Waynoka, Oklahoma purchased a new 1941 2 door sedan in a light green color and was she the talk of the town-population 1500. She said, look folks, I’ve got more money than I will ever spend in my lifetime, so why not spend it on a fine automobile? I hope you enjoy looking at it!! I enjoy driving it!!! Besides that, It is none of your business what I do!!! She was something else!! But, she was one heck of a great lady! This particular car was in the Harrah Auto collection in Reno, Nevada and had been restored to perfection! The 1931’s underwent very modest changes from their 1930 predecessor in that the major changes were only a redesigned radiator shell that included a body color indentation and a redesigned dash. 1931 marked the production of 20 million Fords since Henry began his enterprise!